DENVER — Tax Day is on Monday whether you owe money or you’re getting a refund, some companies are offering some great deals for Tax Day. The deals include everything from half-price cheeseburgers to discounted cocktails and everything in between. Most of the deals are only offered on Monday, but some started early while others extend past Monday. As always, the deals are good at participating locations only. Applebee’s: Get a $1 Strawberry Dollarita with a Twizzler straw at participating locations through April 30. Boston Market: Dine-in customers can get a $10.40 Tax Day Meal Special, which includes a Half Chicken Individual Meal with two sides, cornbread, a regular fountain beverage. It’s available through Monday. Bruegger’s Bagels: Get the Big Bagel Bundle for $10.40 when you sign up for a coupon at Brueggers.com. The bundle includes 13 bagels and two tubs of cream cheese. BurgerFi: Get a $4.15 BurgerFi Cheeseburger on Monday. The offer is available through the BurgerFi app at BurgerFi.com/rewards. 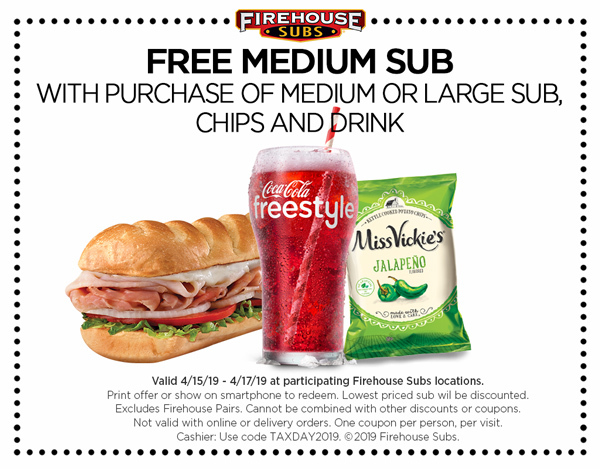 Firehouse Subs: Get a free medium sub with the purchase of a medium or large sub, chips and drink from April 15 to 17. A coupon is required for the deal. Noodles & Company: Get $4 off any online order of $10 or more if you are a member of NoodlesREWARDS. This offer is available now. Office Depot/Office Max: Shred up to five pounds of documents for free through April 27 with a coupon. Park Street Storage: Move into any size unit 10 x 24 or smaller for $10.40. Offer valid April 12 through 19. If you are a Colorado business owner and would like your Tax Day offer added to this list, please use the form below to contact us. Be sure to provide a link to the offer on your website or social media.